When prepared properly, the humble chicken offers a foolproof and fast dinner for any night of the week. There are many variations on roasted chicken, but basic seasonings are all you need to make a flavorful bird. Make sure to use the rendered fat and pan drippings, known as schmaltz, to prepare a rich gravy for hearty potatoes. For the best flavor, start with the highest-quality chicken you can find. Bring the bird to room temperature before cooking to ensure a more even roast. Do not wash the chicken, as this can spread germs around your sink and counters. Any bacteria will be killed during cooking. Use a paper towel to pat dry both the outside and the inside of the chicken. Salt and pepper the cavity of the chicken. Use twine to truss the bird. This not only helps the chicken retain moisture, it also aids in even cooking. When cooking a whole chicken, your greatest flavoring aid is salt. Use at least 1 tablespoon salt for a 3- to 4-pound bird. Sprinkle the salt from several inches above, using your fingers, to evenly coat the entire chicken. Next, season the bird with freshly ground black pepper, to taste. No further seasoning is necessary, unless desired. Heat your oven to 450 degrees Fahrenheit. The high heat helps create a golden brown, crispy skin. Place the chicken breast-side up in a roasting pan fitted with a roasting rack for the most even cooking. Alternatively, use a skillet or oven-safe glass dish. Cook a 3- to 4-pound chicken for 50 to 60 minutes, or until a thermometer inserted into the thickest part of the thigh registers 165 F. Larger birds and those filled with stuffing take longer to cook. There is no need to baste during the cooking, as it will add steam and may make the skin soggy. Remove the chicken from the pan and rest it on a cutting board for 15 minutes to allow the juices to settle back into the bird. Meanwhile, prepare a gravy from the pan drippings or saute vegetables, potatoes or chunks of bread in the juices. Carve and serve the chicken. To create a moist chicken without trussing, slice a lemon in two and place the halves in the chicken cavity before roasting. Add sprigs of fresh herbs, such as rosemary and thyme, and cloves of garlic along with the lemon. Brush the chicken with olive oil or melted butter before seasoning with salt and pepper for an extra crispy skin. Make an herb butter by mixing chopped rosemary, sage and thyme, along with salt and pepper, into softened butter. Allow the butter to set up in the refrigerator. Slip tablespoons of the herb butter under the skin covering the chicken breasts. During baking, the butter melts, moistening the chicken and leaving roasted herbs under the skin. 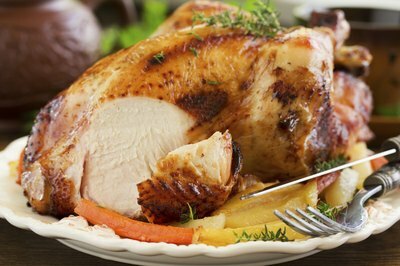 Cook the chicken over a bed of root vegetables, potatoes and day-old bread cubes, rather than a roasting rack. The mix absorbs the chicken juices during cooking for an easy and flavorful side dish.